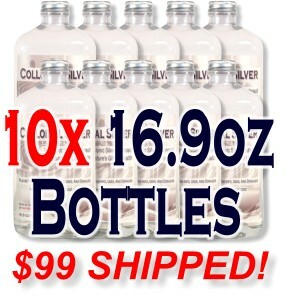 Wholesale Colloidal Silver - 10 - 16.9oz Bottles Shipped for $99! 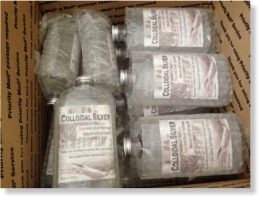 Wholesale Colloidal Silver To The Public! 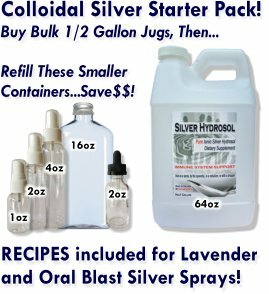 On this page we are offering wholesale colloidal silver hydrosol in 10 packs of 16.9oz/500ml bottles of pure ionic Colloidal Silver Hydrosol at rock bottom prices! NO LIMITS! SAVE money buying in bulk or MAKE money reselling our product! 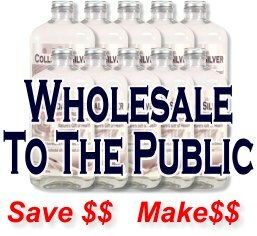 Whether you're looking to save big $$ or make a nice profit, buying wholesale colloidal silver makes perfect sense! Looking to save money? Instead of buying bulky half-gallon or gallon jugs that are hard to pour and difficult to store, this offer instead is for 16.9oz (a little more than a pint) flasks that are super to easy to use and with so many bottles, you can keep them throughout your home or neatly in your pantry! Looking to make money? Who isn't?? At about $8 plus shipping of $2 per bottle, you're actually able to buy wholesale colloidal silver below wholesale! Go to any health food store that sells it and you will see this size bottle easily selling for $20-30 per bottle! Your $99 investment could get you $200 in sales at $20/bottle or about $100 profit! $30/bottle yields a profit of $200! Want your own brand? We can ship your bottles without our label, allowing you to design and apply your own label, creating your own brand!! 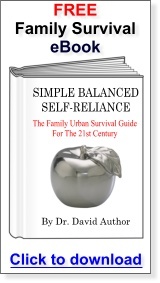 "How can you offer colloidal silver at such low wholesale prices?" We can offer wholesale colloidal silver actually below wholesale cost for a couple key reasons! First, our equipment is top-notch and our production methods are exceptionally efficient. We never have to reject a batch and rarely reject a bottle. Our product is consistently good each time! Second, all of our front end production and back end administration and marketing are done in house. We don't pay expensive ad agents, web designers, etc.... We keep overhead LOW! Finally, we maximize the capabilities of flat rate shipping. We're guessing the Postal Service loses money when we drop off our 13 pound 10-bottle box! We are passionate about colloidal silver hydrosol and want to see more and more people learn about it and use it. What better way to make that happen than to make it affordable in bulk? "Can you tell us about your product?" It's made with distilled and deionized water. Our equipment will reject anything else! 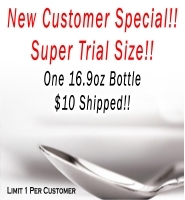 Wholesale Colloidal Silver - 10 Bottles/$99 Shipped! Do you want our label or no label? Good luck with your product! I know you will be successful getting the word out and helping people stay healthy. I will follow your success! It's a really nice product! I will recommend to anyone who will listen. I will do what I can to help promote it. Thanks again!